Southern Utah has captured more hearts and minds than possibly any other landscape in the United States. Stark red rock sandstone rises from the barren Colorado River Plateau, reaching out toward an azure sky dotted with cumulonimbus. The only audible sound? A dry breeze. The remoteness of the place is echoed in every aesthetic aspect. This unique desert landscape is the perfect setting for our spring departure, one that explores the canyons of Zion, the alien hoodoos of Bryce Canyon, and the sheer walls of Capitol Reef. From a logistical standpoint, riding in the remote deserts is not easy. Water is hard to come by, and food even more so. Few cyclists have made journeys like this one; riding with RAID support is a unique opportunity that we’re overjoyed to share with you. When riding in the land of red rock and purple sunsets, utterly new and life-changing experiences await. 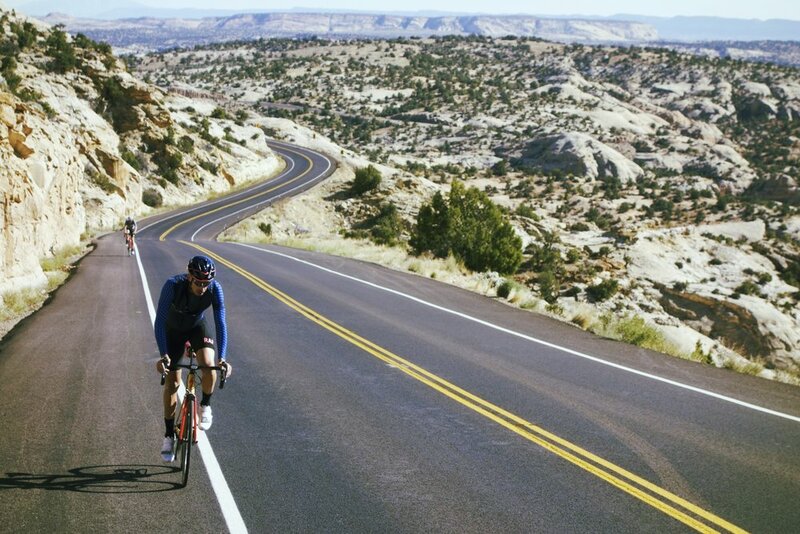 One of the few RAID offerings that forms a complete loop, our journey begins and ends in St. George, less than a two-hour drive from Las Vegas–the perfect opportunity for riders to unwind after a hard week in the saddle. Today, our red rock appetizer of the trip, Snow Canyon, features prominently with its sandstone cliffs, petrified lava flows, and dormant volcanoes. Light laces through its vermillion spines, evoking the first ethereal emotions of the trip, a feeling many will being to recognize as familiar for the next few days. Finally, we’ll roll into the small town of Hurricane (pronounced “Hur-uh-kin” by locals) for lunch before ascending to the gates of Zion National Park, along with a ghost town detour en route. Zion. The ancient Hebrew word for sanctuary. Indeed, this place feels just so. The morning’s tranquil stillness contrasts against the backdrop of one of the country’s most spectacular - and popular - national parks. Zion Canyon’s towering walls draw us into a mesmerizing trance on six miles of perfect pavement, up to the Temple of Sinawava and the Great White Throne. Onward, through the Park’s infamous tunnel, and out into the vast expanse of the Utah desert, toward our destination: Bryce Canyon. There is only one Bryce Canyon. Its unique, alien landscape has been immortalized in thousands, if not millions of images. Its bright orange hoodoo pillars are the largest in the world, akin to a forest of sandstone. It’s an incredible, indescribable sight that few ever forget. After marveling at the spectacular topography of Bryce, we’ll begin our long descent to the tiny town of Boulder, past a veritable kaleidoscope of color afforded by the landscape and cleft plateaus. The inimitable Scenic Byway 12, our path of choice, arcs along the Hogsback south of Boulder, a thin ridge of undulating rock with sheer drop offs into serene canyons below. The parade of visual splendor continues today on the little-known Burr Trail. For those in the know, this is one of the most beautiful roads in Utah, rolling beneath huge sandstone walls in Long Canyon and cutting through the famous Waterpocket Fold, before finally descending spectacular gravel switchbacks to the boundary of Capitol Reef National Park. Long vistas abound, off to the snowcapped Henry Mountains and the red ridges of the Reef. Tonight, we’ll remain in remote Boulder at the quaint eponymous lodge, dining at world-famous Hell’s Backbone Grill, which has been known to sell out its annual Thanksgiving dinner years in advance. It’s a day for the mountain goats as we leave the comfort of the Boulder Lodge for high-altitude climbing. Our 40-mile ascent gains 4,600’, all the way to Brian Head at 11,300’. The views are worth the pain, with vistas 100 miles in every direction, and overlooks peering down into Cedar Breaks National Monument. We’ll finish our trip at Brian Head itself, where a full-service spa awaits for proper recovery from a difficult day in the saddle. Our final day in Utah descends from Brian Head back toward our original departure point, St. George, but not before one of the most serene, tranquil rides of the trip. Cedar Breaks shows its face once again. Then, we’ll explore a quiet, historic dirt road, coasting through ghost towns and the remote farming town of Pinto, once a stop on the Old Spanish Trail, before finding pavement once more at Pine Valley. As we loll back through the sedate desert to our lodging on the outskirts of St. George, we’ll reflect on what we’ve seen over the past week. One of the most beautiful rides in the world? Perhaps - it’s all in the eye of the beholder, after all. In any case, we’re grateful for the opportunity to share it with you.